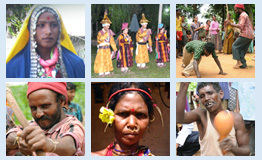 Tharua or Tharu is a language spoken by Tharu community. The community dwells in the Indian states of Uttar Pradesh and Orissa. The exact number of speakers is unknown. The members of the community are mostly illiterate however the present generation is attending schools. Their traditional occupations were agriculture, hunting, fishing, elephant herding and honey gathering. Tharua language is also spoken in Nepal. In India the language is not used in media however in Nepal the language is used in Radio programs. Tharua is an Indo-Aryan language. They use the language mainly in the home domain. But as the language is endangered the Tharu people have forgotten their numbers and use Hindi to count. Influence of Hindi can be seen marked in their speech. Many of the speakers do not even remember the pronouns and use Hindi pronouns for terms like, I, we, you etc. However the community still remembers various Tharua songs related to marriage and other ceremonies and festivals. They celebrate Holi and they have several Holi songs. Tharua people are good artisans. They weave colourful clothes and make baskets. Women of the community generally wear long skirt and blouse with a Chunri. They also wear heavy anklets. Some women also wear heavy chains in their neck. They also love to make tattoos in their hands. Phonological Analysis of Tharua language is completed. According to the innitial analysis the language has 6 vowels and 34 consonants. It can be also claimed that the language has 14 diphthongs. Instances of free variation, gemination, consonant sequences, consonant clusters, syllable structures and morphophonemic alternations were also studied.The dictionary making process is also under progress. Words in various semantic domains like Kinship, Bodyparts, Food items, Adornments, Animals and Reptiles etc. have been already added in the dictionary.